Did you know that the state bird of New York is the Eastern Bluebird? Magnified through the binocular lens of a birdwatcher, this small thrush has a cloak of royal blue from the top of its head down to the tip of its wings, and a warm reddish-brown chest. A native to meadows and woods, it finds a perfect home in rural Upstate New York. 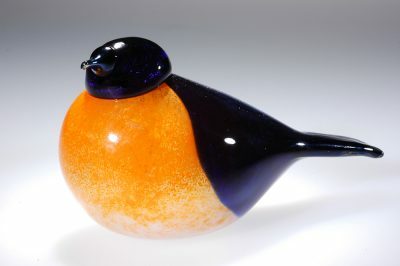 In 2006, the Eastern Bluebird was initiated into the collection Birds by Toikka, by renowned Finnish glass maker, Oiva Toikka, as a commemorative piece unique to The Corning Museum of Glass. Born in 1931, during the emergence of modern Scandinavian art, Oiva Toikka has dedicated his whole life to the principles of timeless design. An influential leader with the Iittala glass company in Finland, he has established a reputation for objects noted for both their beauty and functionality, and his glass birds are no exception. Toikka has been expanding his family of birds for over 40 years. What started out in 1972 with a little glass flycatcher (known as Sieppo in Finnish), small enough to fit in the palm of your hand like an apple, eventually grew into a menagerie of over 400 glass birds, varying in size and complexity. Toikka’s birds exemplify classic traits commonplace in Scandinavian art and design: their shapes are sleek and simplistic, elegant. Missing are the features normally expected of a model depicting a living thing: a face, wings, or talons. Instead there is a uniform shape that changes only slightly in length, or roundness. And yet the species of bird is still easily identifiable, by the angle of its head perhaps, or the length of its beak, or its striking color patterns. It is these understated qualities that make each glass bird unique. Just as ornithologists keep a record of the rare birds they catch sight of, Toikka’s birds are meant to be collected and adored. Collectors around the globe hunt for rarities and eagerly await each new release. In October, Iittala glassblowers Helena Welling and Juha Saarikko came to work at the Museum. The trip was a first for both Helena and Juha, and they were excited to visit and work here. For Juha, a third generation glassblower, this proved especially true: he won his place through a lottery against other Iittala colleagues. The experience presented a few interesting challenges along the way. First, the gaffers had to get used to “American glass,” which they discovered stayed hotter and workable for longer. A practice session on the first night helped them to acclimate. Second, they faced the prospect of a live audience, one that applauded them and shouted out questions. In their Finnish factory, Iittala glassblowers might see a few visitors now and then, but at The Corning Museum of Glass, Helena and Juha worked in front of a packed crowd for three days. Both admitted to being nervous at first, but as they warmed up they began to relax and enjoy the occasion. The Museum’s own gaffer Jussi Sistonen-Lonnroth, a native of Finland now living in Corning, was on hand to translate and assist during the show. Typically, Helena and Juha produce the same bird over and over during a shift, but in Corning they had the opportunity to select some of their favorites. For both of them this is the swan. A larger piece, the swan has an elegant, white body with a long neck. Juha still remembers his first day with Iittala 10 years ago, afraid he’d never be able to make the swan, and now he revels in it. Although working with white glass can be difficult, the end product is majestic and powerful. Oiva Toikka’s glass birds are on display in the Museum galleries and for purchase in the Museum Shops.